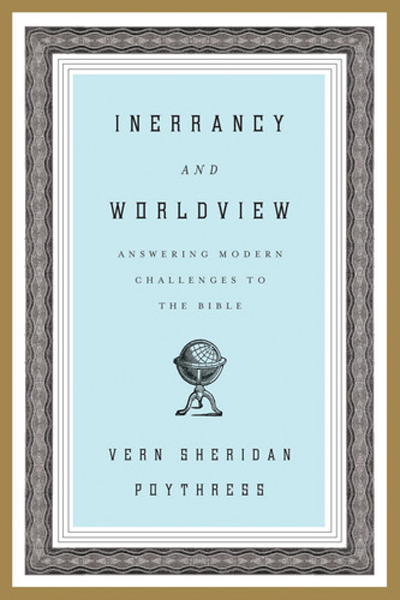 Inerrancy and Worldview is the latest book from Vern Poythress. It is meant to be part of a new trilogy of books centered around challenges to the inerrancy of the Bible (the next book in the series, Inerrancy and the Gospels, is due out in October). Poythress' book thoughtfully explores the numerous reasons why many people (Christians included) balk at the idea that the Bible is inerrant. Poythress defines inerrant as meaning "it is completely true in what it says, and makes no claims that are not true." He points out that attacks are multi-faceted: "some of the voices directly attack inerrancy. Others redefine it" (13). And so the book is aimed at those who would attack inerrancy. Obviously, a book which covered merely objections to inerrancy would be incredibly long, and so Poythress aims at something more modest - and unique. "We will concentrate here on difficulties that have ties with the differences in worldview" (14). At a basic apologetic level, this work is wholly presuppositional in its approach. Poythress never deigns to pretend the Bible may or may not be the word of God. He acknowledges that it is, and then proceeds to diagnose what is wrong with the skeptic - not the Bible. "People come to the bible with expectations that do not fit the Bible, and this clash becomes one main reason, though not the only one, why people do not find the Bible's claims acceptable." Poythress interacts with a range of challenges from a worldview perspective: challenges from materialism, history, language, sociology, anthropology, psychology, perceived contradictions, challenges from our attitudes, and also from our own corrupt spirituality. Some of the most helpful work is done when Poythress utilizes Van Til's personalism vs. impersonalism distinction to answer the 'problem' of miracles. What Poythress does most skillfully is to demonstrate that each and every argument against inerrancy begins with precommitments which distort one's evaluation of inerrancy. The skeptic, for example, perceives contradictions in the text because he does not believe that God speaks through the Scriptures with a unified voice. He has worldview commitments which preclude possible solutions to perceived contradictions in the text. Modernists have issues with the exclusivity of the Christian faith, as well as complaining of the Bible being a sort of 'moral straitjacket.' Even liberal 'Christians' have issues with inerrancy related to a host of beliefs which Poythress demonstrates to be unbiblical. There's something here for every branch of unbelief - Christian and non-Christian alike. The author has no illusions that this book is a one-size-fits-all case for inerrancy. It is not meant to be. It is specifically targeted towards dealing with unbelief at its root, not at its branches. He acknowledges repeatedly that sin is the root of the problems people have with the Bible. In the footnotes he frequently points readers to more substantive books on different subjects where issues can be explored further while plainly refusing to follow rabbit trails (even very attractive ones that would enrich the chapter) - a type of restraint I hope to learn someday. I admire this book as a specially focused apologetic tool. It is thoroughly presuppositional, uncompromising, and refreshingly plain to read. I would not hesitate to put it in the hands of a believer who is struggling through inerrancy, but I do think there are better books, generally speaking, for unbelievers trying to discern if the Bible is what it claims to be. It wouldn't hurt for those peripherally interested to simply read the chapters related to their own bugaboos. Also, I think the appendix (discussing the human authors of the Bible and their place in an inerrant text) is worth the price of admission alone.